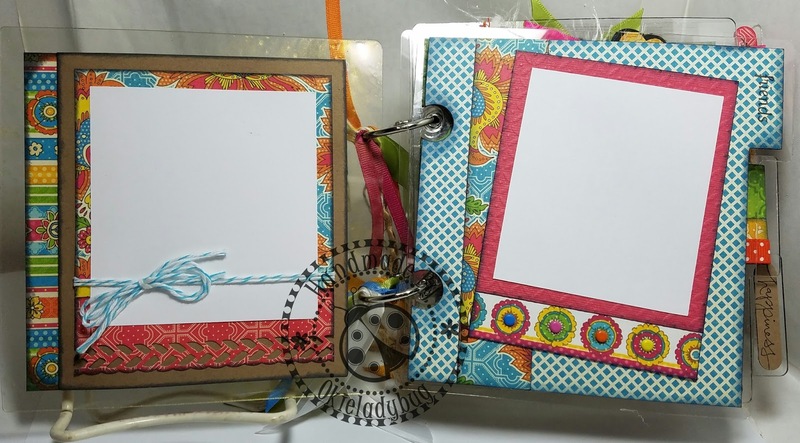 Who here knows how much I like to make mini albums? *okie sees almost every hand in the house go up* Okay then ya'll know me well! This album took me over a year *okie thinks maybe two* to finish because I just kinda got stuck on it and I just boxed it up and put it away. I should say put them away because I made 4 of them, as usual for me! I think it was all the bright colors that were throwing me off with this one...it was like looking at a convention of hippies who crashed their love vans at an intersection! 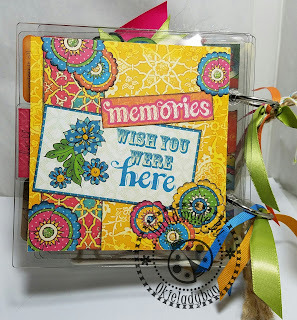 I used a 6x6 acrylic album for this project. I had gotten a really good deal on these a few years ago. I paid $1, yes ONE DOLLAR, for each album and I think I ordered like 20 of them, or some ridiculous number. I did all the designing of the album in Make The Cut and then converted the images to SVG for cutting with the Explore in Design Space. 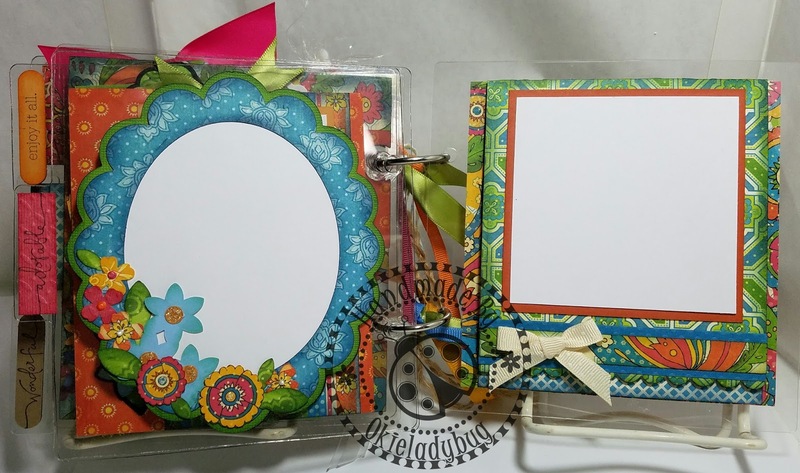 The flowers on front are actually done with punches and I made them to mimic the flowers on the patterned paper. 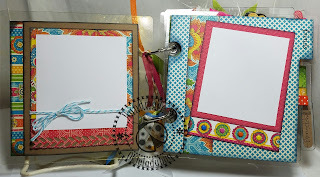 For the page on the left I made it to open up where more photos could be placed and this is a great little way to make more pictures fit in these albums. Before putting the picture mat down I tied some bakers twine around the mat and used a border punch on the strip on the bottom. On the right page I added brads for the flower centers. The flower on the left page was a punch and I spritzed it with water and wadded it up and then folded it back out and let it dry to give it the texture it has. The flower center is a holographic glitter sticker that I found at Dollar Tree. On the right page I made a pocket so I could add tags. 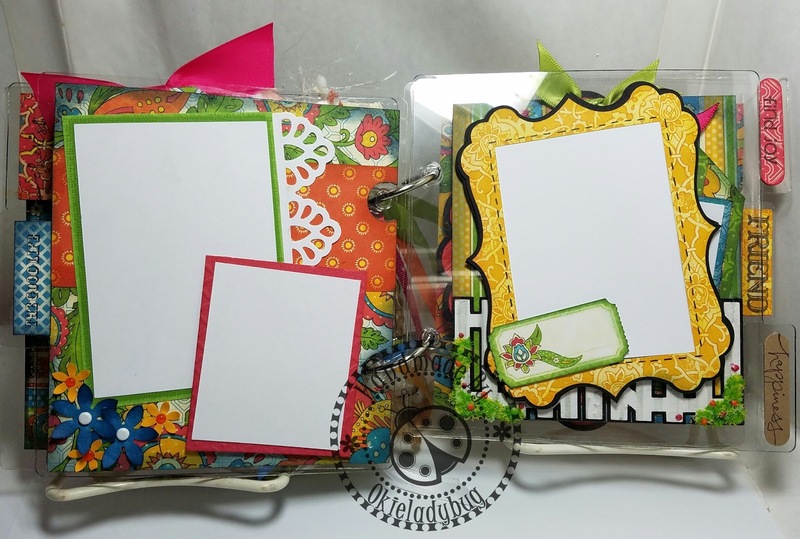 One of the tags is a journaling tag and the other has a place for a picture on the front and bag of the tag. When working with a small space it's hard to try and add more than one photo to a page but adding a small one works okay, you just have to make sure you leave enough room for the a decent picture to work on the larger one so the whole photo isn't covered up. On the left page I used a frame and when I designed the album I made sure to make sure the back side page had the same image. When making a frame and using it on the front and back side of a page it allows some interest of being able to see through to other pages *okie hopes that makes sense but thinks the picture helps make the point*. 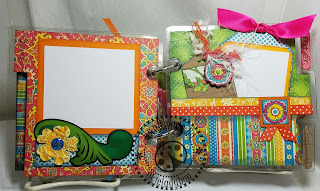 I'm always trying to figure out unique embellishments and I think the little fence for the tag pocket on the right hand page turned out pretty cute. The flowers on the right hand side were cut with the Explore and once again I used brads for flower centers. I decided to use an oval frame on the left and once again the back side has the matching frame size. Oh you might notice too that I added little words on the tabs of the albums. I had to scour through my stamps to find once that worked with the theme. 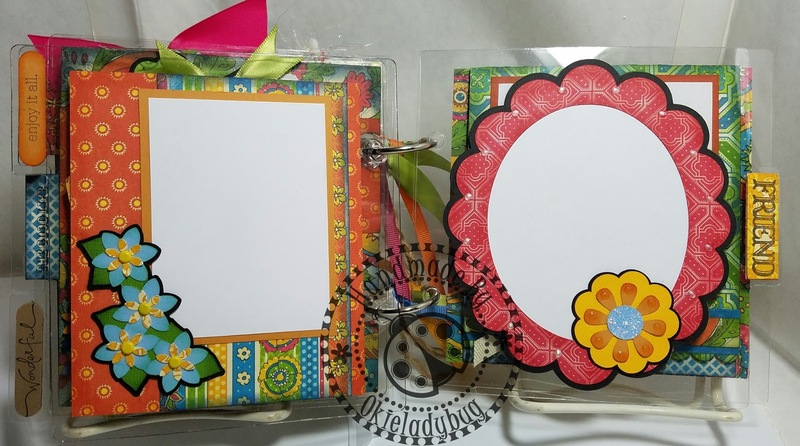 I did a few fussy cutting flowers for the page on the right and then a few punched flowers. One the right page has a flap that lifts up and pictures can be placed on the inside. I really don't like decorating the backs of albums because no one really looks at the backs of such things and when I do decorate I make it as flat as possible. There were a few items in the collection that made it pretty easy to add some decoration to the back. I did fussy cut a few flowers to add but didn't add any dimension to them. Although it took me a long time to finish this album set out I was pretty pleased once I got them done. I gave one to one of my nieces' for her birthday and she loved it. 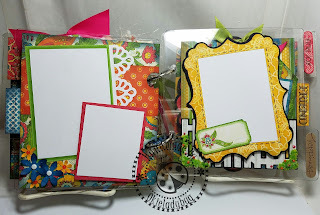 I made sure to let her know the white cardstock pieces were to be removed and used as templates so she could cut her pictures to that size and place in the album. These DO look hippy-happy. 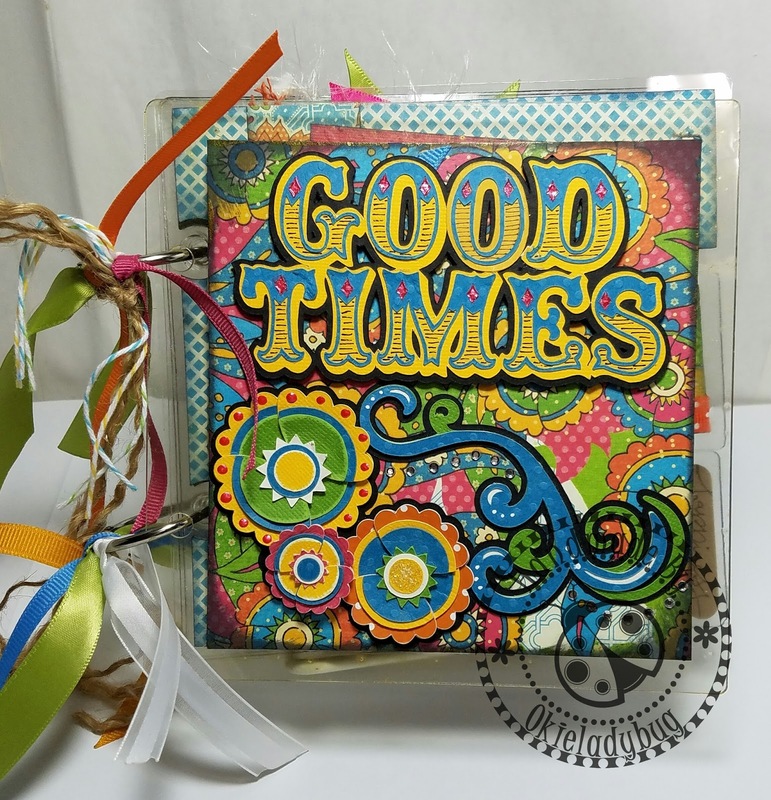 Love the colors and the papers, great job, Okie! You always inspire me- I love my Graphic 45 paper so much. that there be a bit of a hoarding issue. This is amazing! It is fun and pretty, and easy to add pictures to. WOW ... What a joyous explosion of colors and patterns. I would never have thought to put such a delightfully wild combination together - I seem to be stuck in the "matchy-matchy" zone (aka, total bores-ville) - but somehow, this amazing combination works and comes together in a quirky way that is fun, creative and full of personality. The fonts and embellishments you've selected are absolutely perfect for this fabulous little mini.